Students of Izmir University of Economics (IUE) Folk Dance Club shared their stage with the members of Gaziemir Municipality’s Ata Evi Center for Healthy Aging. Members of the Center danced ‘Harmandalı’ and ‘Damat Halayı’ with young students. Ata Evi Team mesmerized the audience. Dancers, between the ages of 18 – 85, performed Zeybek on the stage. 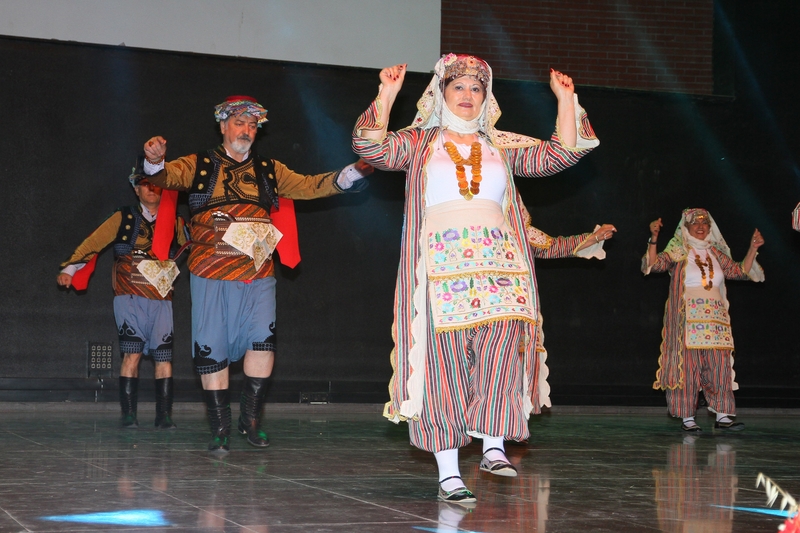 The IUE Folk Dance Club, coached by Trainer Halis Altıntaş, mesmerized the audience with performances from Hakkâri, Burdur, Karadeniz, Kırşehir regions at the “14th Ekonomiden Kalbe, Kalpten Dansa” titled event. The club also performed a mosaic of dances including Zeybek, oriental, and gypsy. Zeybek Art Association also took the stage with whirling dervish, Asuk Masuk, and traditional zeybek performances. IUE Echoir Club Polyphonic Choir sang the Kerimoğlu Anthem and the Youth Anthem. Emre Temese, President of IUE Folk Dance Club, stated that their performances reflected the values of the culture they belonged to, and he said cultural values kept the society together. “Mustafa Kemal Ataturk believed that culture was the foundation of the Turkish Republic. We are those faithful youth who will follow the steps of Ataturk, claim the Republic, and look out for our culture, which is our foundation. We should not forget that folk dancing is a mirror of a culture. We watched three Zeybek performances tonight: first performance by IUE Folk Dance Club, and the second by the members Ata Evi Center for Healthy Aging. We are a team who is proud of adoring our past, our roots, and looking into the future strongly. This special team, who happened to share the experiences of life with us, was loudly applauded. Also, the solo performance of Selim Özyol, Folk Dance Researcher, in Zeybek Art Association’s traditional zeybek performance was spectacular”, said Temese.